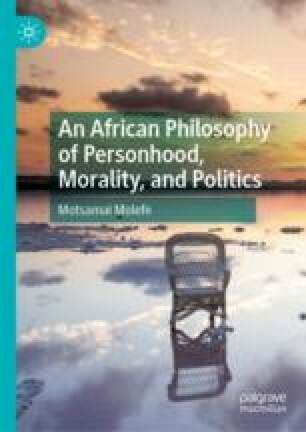 The relationship between the idea of personhood and rights is explored by Molefe in this chapter. The aim of this exploration is to investigate whether rights will feature incidentally or significantly in a correct understanding of personhood. Molefe complicates our understanding of the implications of rights and argues that the idea of personhood imagines an alternative moral-political vision built on the primacy of duties. To do so, he draws on Menkiti’s distinction between the minimalist and maximalist conceptions of personhood, attempting to show the political consequences of these two distinct concepts. He concludes that rights hang on the minimalist approach and duties on the maximalist one. This chapter is partly indebted to two of my previously published articles (Molefe 2017, 2018). In this chapter, however, I give a more robust and systematic exposition of personhood as an embodiment of a political theory of duties. I provide a broader context in the literature and a more compelling motivation for why we ought to move in the direction of duties rather than rights. I give a working definition of the concept of rights and why they are important in the Western political theory, something I did not do in the previous publications. I also offer a clear and extensive discussion and distinction between political systems embodied by Menkiti’s distinction between minimalist and maximalist conceptions of personhood. This chapter elaborates and completes the argument I started in these articles. Gyekye, K. (2010). African Ethics. In E. N. Zalta (Ed.) The Stanford Encyclopedia of Philosophy. Retrieved from http://plato.stanford.edu/archives/fall2011/entries/african-ethics. Last accessed 16 January 2013. Molefe, M. (2019). Solving the Conundrum of African Philosophy Through Personhood: The Individual or Community? Journal of Value Inquiry. https://doi.org/10.1007/s10790-019-09683-8. Wenar, L. (2015). Rights. The Stanford Encyclopedia of Philosophy (E. N. Zalta, Ed.). https://plato.stanford.edu/archives/fall2015/entries/rights/.